As mentioned previously, one strong theme in my book is the sea life of Narragansett Bay, a deep deep love of mine. Many critters are scattered throughout my book and the only dilemma is that people may not know who they are. In an effort to solve this problem, I am creating a “visual glossary” of the sea life. I will provide some text from one of the sea life reference books to give some background on this fish, and an illustration. I am trying to decide which medium works best to create this illustration – either an oil painting or a pen & ink drawing with watercolor wash. So in the following entries, I may provide one or the other, or both. In keeping with my “photo gifts” kind of mood this week, as well as my “Under the Pier” posting today, some new shots of Admiral Byrd waving at you. 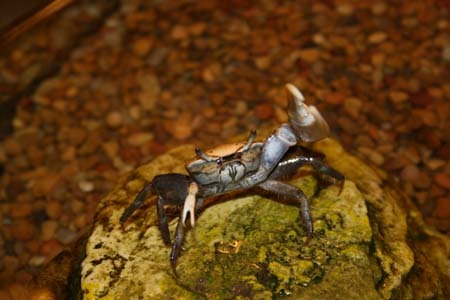 He has got to be the crab equivalent of Arnold Schwarzenegger given he holds that claw up for MANY hours a day, every day now. 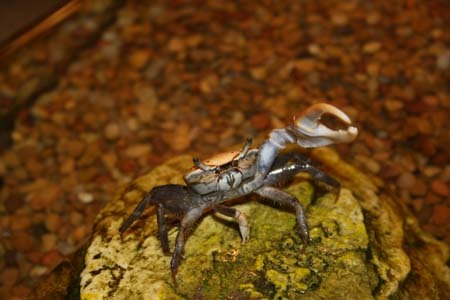 I should be so buff…..
Well the fiddler crab, Scarlett O’Hara’s pregnancy progresses well. I am through “labor and delivery” with Under the Pier’s second draft, and we had an RIP moment for my laser printer, which died trying to print the last two chapters of that draft. Scarlett O’Hara is busy eating or just sitting behind the air filter, in the main fiddler crab tank. Her pregnancy progresses with no odd happenings. Her “nursery” tank is doing well – water parameters are fine and salinity was down to 1.012 when I diluted the water, earlier in the week. I will recheck water parameters and salinity tomorrow in the nursery tank. If they are fine, I will most likely move Scarlett over to that tank Monday or Tuesday. We first noticed her carrying eggs on Monday the 17th. On Sunday the 16th, we saw no evidence of eggs, but that’s when she was spending days living on top of the water filter, sitting in the water currents. So best guess here, is that Monday will be one week. The last time she delivered her babies, it was just about two weeks. So I will move her to the nursery early this coming week. Also, I will shut down the water filter again and just leave the air bubbler running. I picked up eggs and supplies to hatch brine shrimp and will talk more about that tomorrow. I also picked up a liquid food geared toward larval invertebrates, that is a good brine shrimp substitute. NO MORE LIVE PHYTOPLANKTON. I’m hoping that sticking to the zooplankton food approach will work better and not end up with high nitrites that kill off the babies. So more on this tomorrow and this week. 1) Continue on with the posts about writing Under the Pier – I left off on location as character and Part II of that coming up this week will be more info about specific locations in the story — which though fiction, are amalgamations of real places, as well as how I researched them. 3) Start draft three. This time, I can now read through “completed” chapters, and listen out loud to their rhythm, see where they bog down, see where they need more “sensory details” and also go through the large “revision” charts I made up to see if I’ve covered everything. A later post will cover what I compiled for those revision charts. Anyway, that’s the state of affairs here. Oh, and also, given the impending draft three of the book, I need to get going on “Creature Features” So stay tuned! I did not ignore my posting today, just got caught up in revising two chapters of my novel, Under the Pier. I am one chapter’s revision away from being finished with the second draft. At least this time, it looks like a real book, instead of a pile of pages with 10000 “fix-it” cards flapping off the pages like lettuce. (Draft 1). Given it’s late and I”m tired, and given that yesterday’s post was very serious with deep advice, I decided that the perfect balance to that is to seek “Life Advice on the Other End of the Spectrum,” ie “the ridiculous.” For that, one must seek out ….Nancy Drew. I have this book, Clues for Real Life: The Classic Wit & Wisdom of Nancy Drew.” It’s compiled by Jennifer Fisher for Meredith Books. It’s a collection of humorous advice based on Nancy’s adventures in the original 56 yellow-spined books….the ones I grew up with…the only “true” Nancy Drew stories…though we won’t get into those 1930s original versions that are so politically incorrect it’s not only embarrassing but painful. I tend toward the 1950s/1960s versions of the stories. Most of the really offensive stuff was edited out. Anyway, when you’ve really been pushed to your limits, I say, chuck the serious advice and go for the silly. I think even Eleanor Roosevelt and Pema Chodron might agree with me. So I leave you with a few bits of life wisdom, compliments of Nancy’s adventures and the anonymous author of this book. Some other time I will have to give the tallies for how many times in these books, Nancy has been knocked unconscious, her car totaled, her house robbed, her father, housekeeper, best friends, boyfriend and her dog knocked unconscious. I figure by the time she is 40, the brain damage from getting hit over the head or chloroformed, will have set in and she probably can’t afford car insurance because of all the times she was run off the road by the villains. I’ve seen writing books and articles that talk about “setting” as character. For some stories setting may just be the convenient place to locate a tale that could happen anywhere. Though, I have to wonder if that’s really true. I suspect on some level, setting is always a character. I have to think the author chose the particular locations for a reason, if only to give a certain emotional feeling or atmosphere to the story. In Under the Pier, it’s a main character. I can’t imagine it taking place in California, North Carolina, or even New Jersey. There is a unique combination of influences: history-from witches to rebellion to World War II; independent Yankees who kept farming or going to sea, refusing to quit and finding innovative solutions for their problems, even though the land stinks for farming and so many died at sea; ethnic and immigrant work ethics, religion and beliefs; family ties; blue collar industrial types, and a pragmatic, no-BS attitude that sees through and hates charm and flattery. That butts head-on against Yuppie, new money, old money, universities and the intellectuals. You have the heritage of rebels like Sam Adams, abolitionists like John Brown and Harriet Beecher Stowe, and those strange independent types who would spend a year living alone on Walden’s Pond writing a book, thrust face to face with investment bankers, world politics, and cutting edge research. Where else would a large town mayor be accused of Mafia ties and the people still want to keep him in office because he revitalized the region? The climate is difficult – as steamy and hot as the south in the summer, yet bitter cold with Artic winds in the winter. The short growing season and poor land make it difficult to earn a living farming. The sea brings nor’easters and claims fishermen as karmic payment for men daring to venture out there. And yet, they keep going. Crammed right in each other’s faces are the poor and rich, intellectual and backwoods, new and old. The small geographical area makes it a pressure cooker because it shoves these groups right in each other’s faces. Like all places where boundaries meet, the participants cross back and forth between the two sides all the time. You can walk into a diner on a tougher side of town and have a truck driver on one side of you and a neurosurgeon on the other. People are pragmatic. If they want good diner food, they go to where they can get it and it doesn’t matter what walk of life they come from. Tough blue collar dockworkers raise sons and daughters who go to Ivy league colleges and have letters after their names like “PhD.” In fact, it’s almost an unwritten law in those harder places that you make sure your kids work hard, “get an education” and get a job where they don’t have to “do what their parents had to do to get by.” In a culture where immigrants measure progress in generations, the force and focus is always on making sure that next generation moves up a notch and has that “security” the previous generation never had. So in looking this over, if this isn’t a character in its own right, I don’t know what is. Under the Pier is set in one of those boundary places that straddles the worlds of commercial fishermen, dockworkers, manual laborers, and factory workers, vs the “new moneyed” rich tourists who fill their restaurants, the higher class well-educated intellectuals, and old money. Max lives in the world of diners and auto body shops, commercial fishermen and the wharfs downtown. Her grandmother, Connie, is a widow, and has worked in Rosa’s diner all her life. It’s where she met her husband who came back from Vietnam and drove trucks for Grunder’s Moving and Storage until he died. Her grandmother’s total focus was to make sure her kids had the security and respect she didn’t have when she grew up. It’s all about prestige, money, position, getting ahead, but it’s really about security. If you have the others, the thinking is, you have the security. Connie’s youngest son is one of those who have crossed the line. He’s a post-doctoral researcher dating another PhD whose love is all those undersea critters. Her oldest daughter is a business consultant married to a successful doctor and lives in an exclusive area in Farmington CT. The biggest worry of Connie’s life was that middle daughter, Alicia, Max’s mom, who threw caution out the window, followed her artistic heart to Cape Cod, and worried her mother to death because she rejected most of her mother’s values….at least on the surface. So the “personality” of the place, creates the personalities of the people who live there. From those personalities and the fact they’re all thrown up against each other, you get, story conflict. Coming up next: Place as Character, Part II: Specifics of the Story’s locations and the research behind them. Admiral Byrd has been robustly marching around the tank, and no matter if he’s on “gravel hill,” the top of his “fake cave” or perched on “live rock” he stands tall and waves his claw. We just walked back in the house from dinner and the first sight to greet us across the kitchen was Admiral Byrd waving. Now we know deep down inside that he really couldn’t care less about us unless we’re a female fiddler crab, but still, on a tired night we could live in denial and pretend our “pet” is welcoming us home. On a bit more serious note, I received a great comment from someone about my post on the death of the fiddler babies and how the Discovery forum person, Horseyhannah, said not to even bother trying to raise babies. This person currently has living crab larvae – day 3 – and she’s offered a lot of ideas from her own experiences. 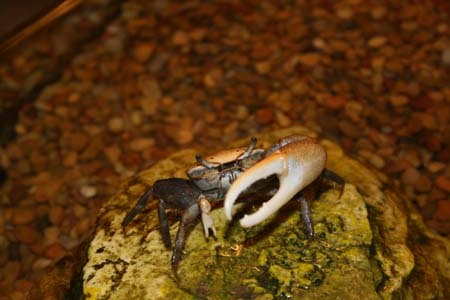 There is SUCH good information and several suggestions for fiddler crab owners in her comments. I wanted to first say THANK YOU! And secondly, for anyone who didn’t catch the comment, just click here to read it. She noted that she doesn’t use substrate on the tank bottom, which is interesting to me. I have heard others who’ve done the same, so I think there might be some merit to that approach. For myself this time around I will use the calcium substrate, since by the time I got that post, I had already started setting up the nursery tank with the new sand. So I’ll see how the sand “experiment” goes. But still, her approach to not using substrate seems very interesting and if she wants to send any updates on how it’s going, that would be great. I imagine there are many others out there who’d like to know if that is a better way to go. So anyone with info on keeping the tank bottom bare, please do send along your experiences. 1) – There are many more posts to come on the progress of my novel, Under the Pier, and about life in general. For anyone who is following the progress of my “Author Journey,” or for the process and progress of my novel, Under the Pier, I’ve done the same thing. Each topic has a page with all the posts listed there, and live links to them. If you should find your way to my blog on a page that doesn’t have the “Page list” on the right, just click on the Soul Mosaic words in my header and it will bring up the main day’s page. Then you’ll see the Page list on the right. Well, I will re-group tomorrow. It is simply nice to know that in spite of irritating taxes and bills and other life annoyances, there are those constants like Admiral Byrd waving his claw no matter what time, day or night, that you walk in the room. The fiddler babies continue to thrive. I notice the numbers are down in the tank, and we also noticed they seem to congregate on the right side of the tank, near to the live rock. They swim in and out of the live rock crevices, and some do wander to the other side of the tank to investigate the water filter which is not running at the moment. They probably figure it’s another cave because any babies over there tend to hover under or behind the non-running water filter. But even as tiny guys, they know to keep to shelter. My husband diligently checks on them with the flashlight and noted that they are bigger…he commented that since birth they have grown from “periods” to “commas.” It will be interesting to see how many survive. The tank is “ocean” level salinity now at around 1.020. I’ll keep it there until the 17th, which will be two weeks “in the ocean” for the guys. About that point I will start doing water changes and bring the salinity slowly back down to the brackish level I keep the adult tank at: 1.010-1.012. I am keeping an eye on the nitrite levels in the babies’ tank since it’s up quite a bit. I added Amquel to lower the nitrites but I never really see that happen with that or Prime. I sometimes wonder if the solutions to bring the nitrites down are really “placebos” for the owners of the tanks? In any event, monitoring water quality, especially since I’m putting liquid food into the babies’ tank 3 times a day. The adult tank has been “business as usual” – Melanie Hamilton spends most of her life hiding inside the live rock, Admiral Byrd is ALWAYS waving his claw these days, and about the only difference is Scarlett O’Hara. She must be recovering from “pregnancy and childbirth” because she has NOT stopped eating. She is shoveling in shrimp pellets and picking algae off everything, with both claws at once. She gives “two-fisted eating” a whole new meaning. It is non-stop, almost “frantic” in its intensity. I guess she is making up for lost time and nutrients. Otherwise, she seems fine. That’s the goings-on today. Working on the next Under the Pier installment, hopefully to be done for tomorrow. Need to finish some chapter revisions first. Stay tuned.